There has been immense hype for this book. And while many may be clamouring for a copy, the sale effort does not match the marketing effort. Hard PR work has been put in by the author Lukas Straumann with several media statements issued, news conferences held and road shows organised. Even a radio show appearance to tout the book. Trotting around the globe, the Bruno Manser Fund director appears to want to outdo the timber trail that he wrote. 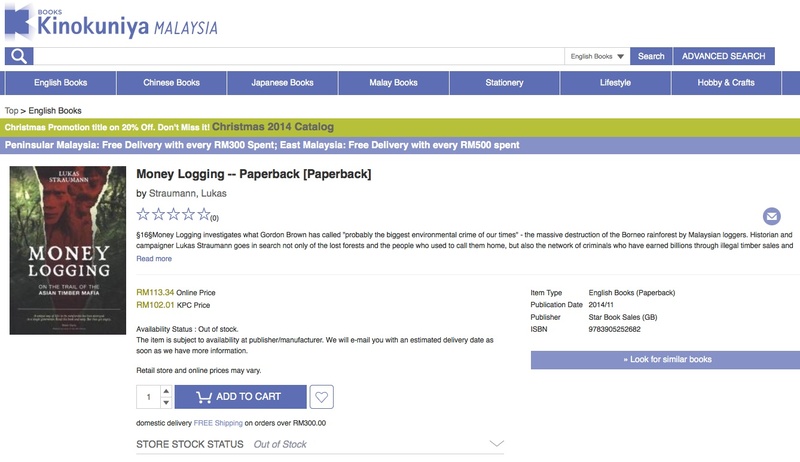 BUT one cannot buy a copy off the shelves from any of the leading book stores here in Kuala Lumpur. Big book stores like Kinokuniya, Borders, MPH have no inventories. Their new arrival shelves don’t display. Their best seller charts confirm its absence. And even the Indian news agents who often sell rare publications that don’t make it to the giants, have not heard of it. Whether Amazon does decide to sell, is left to be seen. Soon, in a few weeks, the sizzle will fizzle. The book stores with their myriad of alternatives will distract your choice. Assasin’s Blade or just Yes Please?